You are cordially invited to attend the opening of the exhibition on Thursday 19 May at 8 pm at the Mestna galerija Ljubljana. 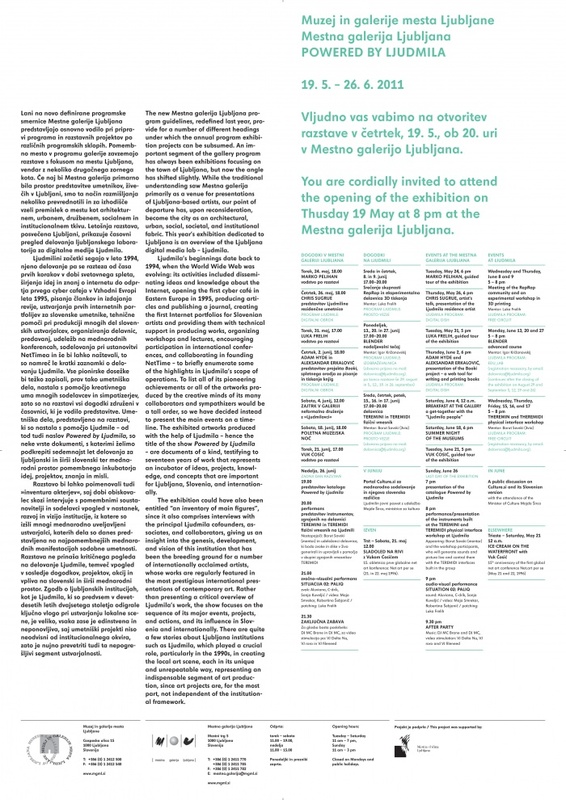 The new Mestna galerija Ljubljana program guidelines, redefined last year, provide for a number of different headings under which the annual program exhibition projects can be subsumed. An important segment of the gallery program has always been exhibitions focusing on the town of Ljubljana, but now the angle has shifted slightly. While the traditional understanding saw Mestna galerija primarily as a venue for presentations of Ljubljana-based artists, our point of departure has, upon reconsideration, become the city as an architectural, urban, social, societal, and institutional fabric. This year’s exhibition dedicated to Ljubljana is an overview of the Ljubljana digital media lab – Ljudmila. Ljudmila’s beginnings date back to 1994, when the World Wide Web was evolving: its activities included disseminating ideas and knowledge about the Internet, opening the first cyber café in Eastern Europe in 1995, producing articles and publishing a journal, creating the first Internet portfolios for Slovenian artists and providing them with technical support in producing works, organizing workshops and lectures, encouraging participation in international conferences, and collaborating in founding NetTime – to briefly enumerate some of the highlights in Ljudmila’s scope of operations. To list all of its pioneering achievements or all of the artworks produced by the creative minds of its many collaborators and sympathizers would be a tall order, so we have decided instead to present the main events on a timeline. The exhibited artworks produced with the help of Ljudmila – hence the title of the show Powered by Ljudmila – are documents of a kind, testifying to seventeen years of work that represents an incubator of ideas, projects, knowledge, and concepts that are important for Ljubljana, Slovenia, and internationally. The exhibition could have also been entitled “an inventory of main figures”, since it also comprises interviews with the principal Ljudmila cofounders, associates, and collaborators, giving us an insight into the genesis, development, and vision of this institution that has been the breeding ground for a number of internationally acclaimed artists, whose works are regularly featured in the most prestigious international presentations of contemporary art. Rather than presenting a critical overview of Ljudmila’s work, the show focuses on the sequence of its major events, projects, and actions, and its influence in Slovenia and internationally. There are quite a few stories about Ljubljana institutions such as Ljudmila, which played a crucial role, particularly in the 1990s, in creating the local art scene, each in its unique and unrepeatable way, representing an indispensable segment of art production, since art projects are, for the most part, not independent of the institutional framework.